"Regn, there is nothing to fear here. Not for you." Climate change is something affecting our planet. Finding ways to stop the damage is vital, but that doesn't stop detractors from naysaying the efforts. It'd be helpful to have an individual who could heal the planet with special powers, as in Awake #1 from Action Lab Entertainment. The issue is written by Susan Beneville, illustrated by Brian Hess, lettered by Jaymes Reed and flatted by Darne Lang. Regn is a 12-year-old with the power to wake and heal planets. But, on her first mission, she lands on the planet Gremon, where she discovers an angry planet tearing itself apart, an irresponsible big brother and a greedy baron who stokes the chaos for his own benefit. Her power may not be enough when she comes face-to-face with the planet’s consciousness. Awake #1 more or less drops the reader right into the thick of things, giving both Regn and the reader fairly little context to begin with. Regn wakes up a little disoriented, but quickly comes to realize where she is and what her role is as it pertains to the planet, courtesy of Beneville's relatively simplistic style. Much of the first issue focuses on Regn's interactions as she brings herself up to speed on the current situation. Beneville does a great job though of unfolding the story in a way that feels natural, through some rather straightforward exchanges among the characters. There's an interesting sub-plot that's briefly introduced as well that will likely play out in a contrasting (and probably antagonistic) fashion to Regn's story. The illustrative style of Awake #1 is clean and concise. 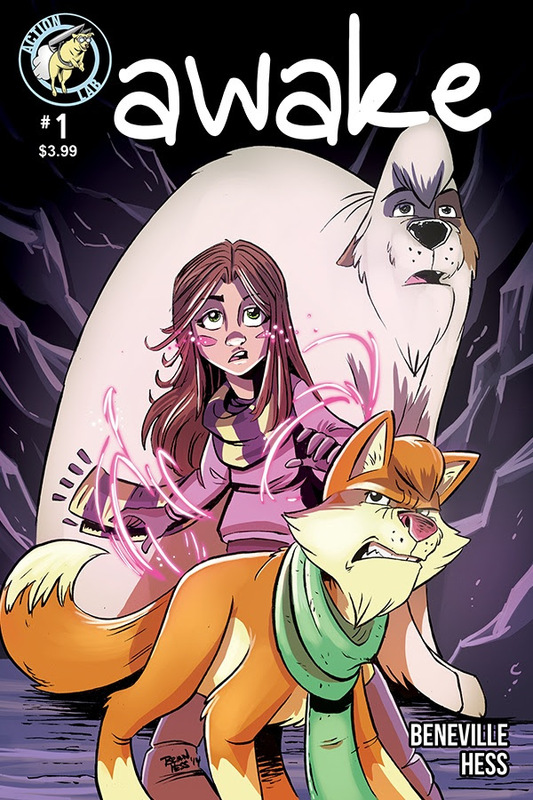 Hess relies on a style that evokes Saturday morning cartoons, as characters are clearly cartoonish in appearance and add a family-friendly appeal to the book. The characters boast physiques that feature sharp angles accenting certain characters and rounder faces accenting other characters. Hess also does a great job of rendering both human and animal characters in very similar fashion, prompting all the players to feel as if they do exist within the same universe. The coloring effects by Hess for the demonstration of the powers is especially notable, as it tints those relevant pages and help immerse the reader in the powers of the book. Awake #1 is a very approachable and enjoyable comic. It capitalizes on the concept that there are individuals with the capability to heal planets and how they use those abilities. Beneville's story is very accessible and promises to delve a little more deeply into supernatural powers without being too frightening. Hess' illustrations are equally as friendly in appearance and lend to its friendliness without undermining the more serious aspects of the plot. Awake #1 is a solid first issue that rather simply poses a few questions for the series to answer as it unfolds. Awake #1 is currently available for pre-order through Diamond Distribution (Order Code: JUL150868) and scheduled for a September 2015 release.